The girls over at SITS are hosting a series about Halloween. How fun! The best part, one lucky SITSta will win a Canon EOS Rebel T2i. Who needs candy when you can get a treat like that?! The theme for today, Halloween Past. I am happy to share with you, my boys.This seems like so long ago. Now they are all teenagers and would not be caught dead dressing up in anything but a ghoulishly, bloody mess. I have fond memories of taking them out trick or treating. Now, I have to pat them down before they go out to make sure they are not taking the eggs or toilet paper with them the cause mischief! lol! But thankfully, because of our seven year pause between the boys and the girls, I still have a few years of cute costumes like these. This was taken just two years ago. I am sure when the girls hit their teenage years, I will be going through a lot of the same things that I am going through with the boys. So, I am going to enjoy it while it lasts! Happy Halloween! Would like to share your Halloweens of the past? Link up over at SITS! Who knows, maybe you will even win a cool treat for yourself! I am so looking forward to blogging about Halloween with the wonderful ladies at SITS. They all look so cute! Sad, but boys costumes don't stay cute long. :( My boys are already approaching the age where every costume comes with a weapon or blood. These pics get a big aaaaaw! Adorable! So sweet! I love the firefighter's facial expression! Happy Halloween. So sweet Halloween pics!! My mom has a pause with us kids too! My two brothers were 7 and 6 when I was born. Then came my sis. What fun! You get to live Halloween again through your little ones eyes. Your kids are adorable! I can't believe you have five. And THREE teenage boys. I couldn't do it. But I bet you have fun! 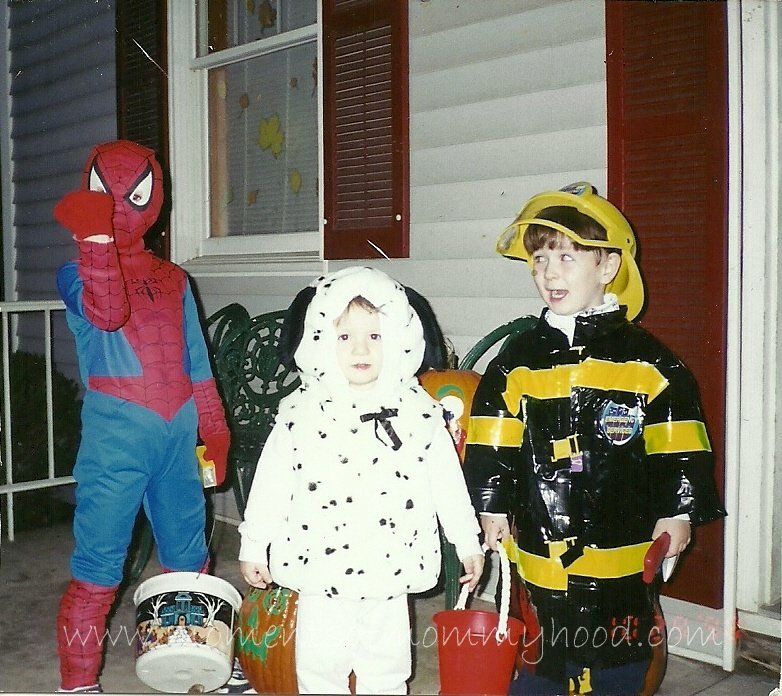 The Dalmatian costume is my favorite, and then the look on Brandon's face is GREAT!